The arms race between the Soviet Union and the United States was the most dangerous confrontation in the history of the world. Nikita Khrushchev's decision to place nuclear missiles in Cuba, and John F. Kennedy's willingness to call his bluff, brought the Soviet Union and the West to the edge of a cataclysmic nuclear war. Kennedy's confidence in his brinkmanship hung on evidence provided by Oleg Penkovsky, the MI6/CIA agent inside Soviet military intelligence. While researching Penkovsky's story, Robert Holmes stumbled upon an astonishing chain of intrigue, betrayal, and revenge that suggested a group of maverick Soviet intelligence officers had plotted the crime of the century. When Penkovsky's treachery was discovered he was executed and his boss, General Ivan Serov (the head of Soviet military intelligence) was humiliated. 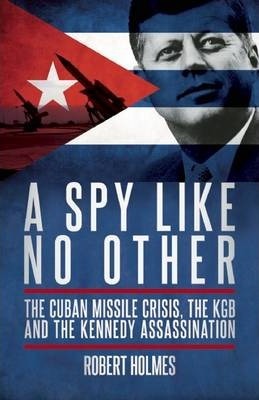 In this extraordinary study, Holmes suggests Serov's anger at America's victory in Cuba and his resentment at the treachery of his protÃ©gÃ© turned into an obsessive determination to gain revengeâ€”and reveals the opportunity he had to do so by working with KGB rogue officers to enlist a young American loner, Lee Harvey Oswald, to assassinate the President. Robert Holmes was born in Belfast, Northern Ireland. He was a British diplomat for more than thirty years, serving in a number of foreign capitals including Moscow, Russia, and Budapest, Hungary, during the depths of the Cold War.